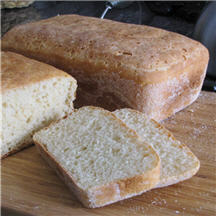 An excellent, yeast-risen English muffin bread that has the familiar nooks and crannies just like its smaller muffin cousin, but is much simpler to make because it "needs no kneading" and requires only one rising. The crusty bread has a soft, pleasantly toothsome texture that goes well with most meals, makes a great sandwich...and of course, makes terrific toast! From start to finish, this homemade bread is ready to eat in less than 90 minutes. Grease two 9 x 5 x 3-inch loaf pans. Place about 1 tablespoon cornmeal into each greased pan and evenly coat all sides, tapping out any excess; set aside. In a large mixing bowl, combine 3 cups flour, yeast, sugar, salt and baking soda. In a saucepan, heat milk and water until very warm to the touch (or heat in a 4-cup glass measure in the microwave). Stir warm liquid into the dry ingredients, add flour and stir just until combined. Dough will be and sticky. Scrape dough out onto a lightly floured board or flat surface, roll dough around, adding just enough flour as needed to bring it altogether (and keep it from sticking to your fingers) and then divide in half. Place dough halves into the prepared pans, gently pressing to spread the dough evenly. Cover each pan with a sheet of plastic wrap that has been coated well with cooking spray and let rise in a warm place for 30 to 45 minutes, or until doubled in size. Uncover and bake in a preheated 400°F (205°C) oven for 20 minutes, or until nicely browned and bread sounds hollow when lightly tapped on top. Makes 2 loaves or 32 servings. Storage Tip: This bread freezes well. Once it has cooled, slice the bread, place in a large plastic freezer bag and store in the freezer. The individual slices come apart easily and are ready for toasting, no thawing needed. Nutritional Information Per Serving (1/32 of recipe): 90.0 calories; 5% calories from fat; 0.5g total fat; 1.2mg cholesterol; 134.4mg sodium; 57.6mg potassium; 17.9g carbohydrates; 0.7g fiber; 1.2g sugar; 17.2g net carbs; 3.0g protein.